It’s a very formulaic JRPG. It doesn’t even look that great. The character sprites are average. The tiles often look drab and washed-out. I found the setting especially unappealing. It’s a combination of uninspired western LOTR fantasy and dry, obscure asian mythology. It lacks the style and flamboyance of a Square Enix production. But there is more here that meets the eye. The first few quests are formulaic but it soon becomes apparent that the story is constructed in a very well thought-out way. It’s just laced with graceful set-ups and pay-offs that keep the ball rolling. The missions always make sense within the overall story. The characters are stereotypical but their intentions are clear and consistent. Unremarkable but solid. The regular battle screen is standard JRPG fare. And then it gets really crazy. The plot revolves around the son of a general being accidentally accused of treason and turning into a the leader of a rebel army. And the game actually TOTALLY pulls this off. So eventually, you move into your own rebel hideout. You start recruiting dudes for your army. Almost every NPC in the game is a character you can recruit. There is a total of 108 (!!!!) individual characters. Think Final Fantasy where every NPC you talk to is a character you can collect in a Pokémon-esque fashion. And then add a touch of Harvest Moon for the way your rebel base grows as characters come in. Actually, I always found myself thinking about how close this game feels to something like Mass Effect. And yet it’s light-years ahead of Bioware in some regard. Here are some observations. Depicting War – The story is very much centered around war. So is Mass Effect. Many games are. The unique thing about Suikoden is that it actually takes the time to develop mechanics do properly address this topic. Most games have a central game mechanic that focuses on small-scale combat. In RPGs usually a small team of heroes fights small groups of enemies. But those systems always seem to break down when they need to represent a different scale of combat. So in Mass Effect 3 when you are fighting the Reapers it becomes very difficult to rationalize why you still control just 3 guys even though the story vamps up the scale to depict a huge galactic war. You were supposed to be a person, who pulls the strings. But suddenly you turn into an insignificant gear in a huge engine that seems to be running just fine without you. The opposite happens when the game wants to depict duels. It becomes very difficult to design boss fight that work with the combat mechanics The mechanics weren’t made with boss fights in mind. 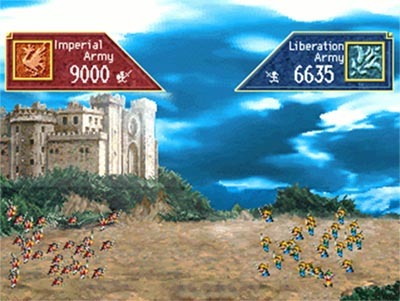 Suikoden has a separate battle mechanic to show major battles. Suikoden has 3 different combat mechanics for different scales. 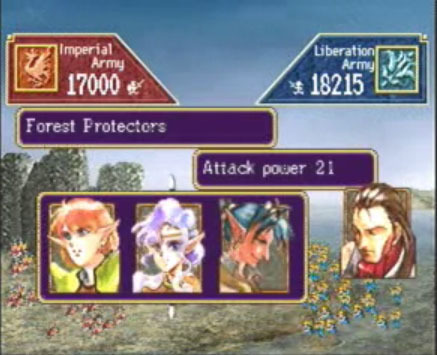 There is a standard JRPG menu battle system for questing and various missions. There is a simple but effective grand battle system to depict major confrontation between armies. There is also a simple duel system for some boss fights. The latter two are basically dressed-up variations on Rock-paper-scissors. But they do a great job of communicating the idea. Clustering – With 108 characters, one would assume it’s easy to lose track of them all. After all, there is this legend that humans can only remember 7 items at once. And sure, there are some forgettable characters among them. But it’s not as chaotic as the sheer number would suggest. I was actually surprised how meaningful and memorable the characters were. I think one reason for this is that the game used multiple layers of clustering. Characters are not just random items you collect. Certain characters belong together. So for example, some characters have relationships and ties with each others. There are lovers, friends and families. You act out those relationships in the story. Some characters only join you if you bring another character they know with you. Another way of clustering is the Unity command. Some characters can join with each other during combat for especially devastating attacks. These attacks become very important when choosing which characters to bring with you. Which characters work together is often influenced by their relationships. Friends tend to be able to use Unity together but now always. It’s something you discover and act out yourself. Finally, the characters are actually visually clustered in the grand battles. In this system, the characters represent different orders. Characters that represent similar orders are clustered in triplets. 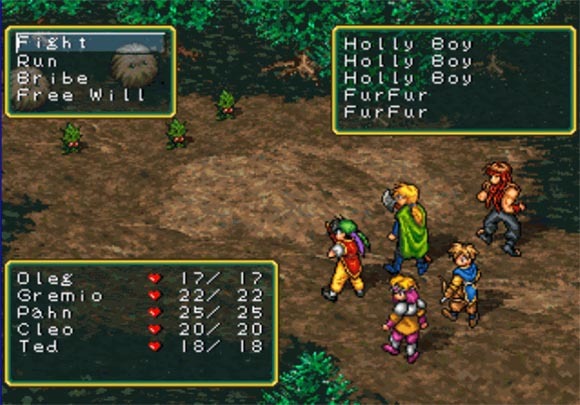 During major battles, characters represent commands. Related characters are thematically clustered. So for example, a certain bow attack is represented by different 3 elf characters, who use bows. It’s not only a great way communicate the relationship between individuals and a massive battle. Just as the above examples, it also additionally helps grouping the various characters into clusters and helps keeping track of them. I always felt the best storytelling in Mass Effect, especially the 3rd one, were the little moments where characters interacted with each other – conversations you accidentally pick up in a hallway or in an elevator. But perhaps with the exception of Mass Effect 3, the crew still felt more like a loose collection of individuals. All the relationships were often aimed at Shepard, not at each other. There rarely was anything going on independently of the player. Suikoden demonstrates quite well how you can maintain an incredibly large and vivid cast if you just establish some simple relationships between them. Dog Fort – Personally, the game didn’t really start for me until I moved into the fortress. Initially, it’s a dungeon you need to clear from monsters. The various team members you recruit soon move in, set up their own rooms and establish facilities. Eventually, new areas are opened as the fortress grows. It’s incredibly satisfying. It taps into this childish joy of building a fort out of pillows or a tree house. It’s also a great tool to visualize the growth of your army. A modest cave dwelling soon turns into a mighty fortress. Your ugly rock soon turns into… ugly rock with a castle within. I was reminded that Mass Effect never really had anything like this. Some areas of the Normandy unlock gradually in Mass Effect 2. And there are some upgrades you can install on a list somewhere. But it’s never something you feel and experience. It’s never something that surprises you. It never keeps you guessing how far it will go. The Normandy doesn’t grow into something different. Squad – I had some flashbacks to strategy games like X-Com or Jagged Alliance when choosing squad members. You only have 5 slots. Some missions require you to take some members with you. So you constantly need to try out new combinations. It’s also pretty fun to do it anyway. The fact that there are so many characters is liberating. It’s clear that you won’t be able to try every one of them so it’s ok to just go with personal preferences. There is a front-row/back-row mechanic to help you trimming down the list of possible candidates. The above mentioned Unity command rewards experiments. Because of the grand battle mechanic, you don’t feel too bad about never using certain characters. There are other opportunities to make each one of the 108 team members feel useful. In contrast, I was reminded of how Mass Effect 1 rewarded you for playing the entire game with just 2 characters and having the rest just rot on the ship and do nothing. Leveling – Finally, there is a great game design detail I really appreciated. Leveling is tweaked in a very specific yet extreme way. It seems like characters level up incredibly fast when fighting much stronger monsters. But once they reach a certain level, the leveling plateaus. So when you bring in a new team member to the squad, they are able to catch up with the rest almost instantly. It takes just 2 or 3 battles, it’s THAT extreme. On the flip side, grinding levels doesn’t really work due to the plateau effect. So level bosses are really crisply balanced. I had multiple boss fights throughout the game where I literally won with my last character in my final round. I’d love to learn about the mathematics behind the system. It seems to be really well designed. Again, I remember the awkward solution in Mass Effect where characters would level up even if they were waiting on your ship. 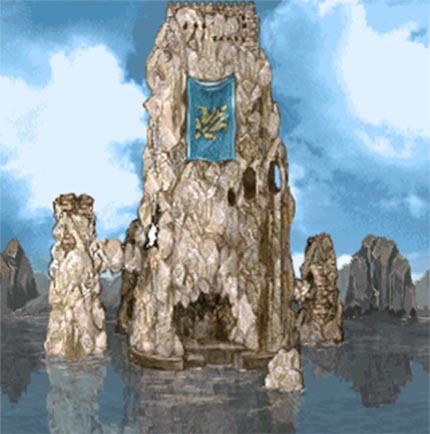 In general, Suikoden is really an incredibly solid game with lots of bold, well designed solutions. I can thoroughly recommend it. I’m actually thinking of playing the second part was well. I heard that it’s even better. It’s not on PSone Classics. And apparently they didn’t print too many copies back in the days becase the prices on eBay are… discouraging. Yikes! I adore Suikoden. It’s in my top three RPGs and regularly vies for the number one slot. The sequel is just as good but hideously expensive to buy. This brought back good memories of Suikoden for me. Thank you! Do pick up Suikoden 2. It is worth whatever they’re asking. You really should check out Suikoden II, it is like the first one but better in nearly every way (better graphics, but same style, better gameplay and character customization, longer, more dramatic…). The others are pretty good, too, I think everyone should at least try them. Excellent article. I loved Suikoden and Suikoden II, and it always makes me happy to find that I’m not the only one who remembers them. There are a few amazing RPGs on the Playstation that are almost forgotten and very rare. I recommend if you find a way (aside from paying thousands of dollars!) you should try Suikoden II and my personal favorite, Legend of Mana. So good. I’m not sure about applauding Suikoden while shitting on mass Effect, we already know about ME’s lack of design. My favorite is Suikoden V, with it’s old-school feeling, incredibly classic and solid narrative structure and gameplay, and interestingly simple characters. Loved all of it. Disclaimer: My memory of Suiko 1 is a bit rusty. Here’s my take on how to balance the damage model. The plateau effect makes balancing easier; I can determine the player’s maximum level at the fight and the resulting HP, damage output within a range. Individual characters differ from a base range within a fixed %. Math takes over from there. *Boss hp can be expressed as total player damage per turn multiplied by expected number of turns, then tweaked by subsequent playtests. *Boss damage can be expressed as a fraction of player’s HP (30-70%), so the damage is significant and not overkill. Bosses in Suiko 1 rarely take double turns for each player turn, which makes the balancing easier. *Boss abilities boils down to taking boss damage model and balancing it against its additional effect. E.g. if i make the ability AOE across a row, it will hit up to 3 characters. I balance the increased number of hits by dividing the boss damage by 2.5 (so it does more damage overall). P.S. I rarely found the ability and unity attacks to be that useful in Suiko 1. Autoattacks coupled with defensive abilities were more effective most of the time.